Description: Arctic wolves have only recently been given their own subspecies classification, historically being considered a colour phase of the gray wolf . Born brown or black, arctic wolves turn white by the end of their first year, with only a small patch of dark hair persisting above the base of their tail for the next few years. Similar in size and shape to the gray wolf, their white coat may have a thicker under-layer for protection in their colder environment. 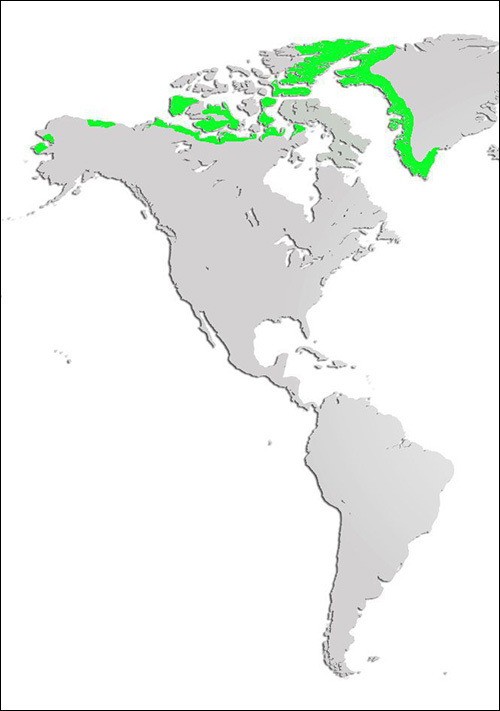 Distribution and Habitat: The artic wolf is found only in the most northern parts of North America. They inhabit some of the harshest terrain in the world where air temperatures rarely rise above - 30° C (-22° F) and the ground is permanently frozen. Diet: Carnivores, artic wolves are opportunistic hunters, preying on large mammals such as muskoxen and caribou when available, but able to exist by preying on smaller animals such as arctic hares, snowshoe hares and ground squirrels when necessary. Life Cycle: Like gray wolves, arctic wolves mate for life and live in a socially complex pack dominated by an alpha pair. Mating occurs in March/April and litters of 5-6 pups are born 9 weeks later. Arctic wolves will use sheltered rocky areas and gravel berms for whelping dens and remain there until the pups are several weeks old and able to travel alongside their parents. Play forms a large part of the growth and social development of young wolves, and wolves will continue to play, with other wolves and alone, well into young adulthood. 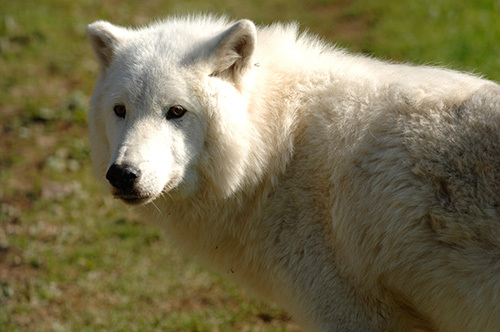 Adaptations: Artic wolves have a white coat allowing them to blend in with their cold, snow-covered environment. Did you know? Wolves can communicate with tail movements.